For decades, university presses and other scholarly and professional publishers in the United States played a pivotal role in the transmission of scholarly knowledge. Their books and journals became the "gold standard" in many academic fields for tenure, promotion, and merit pay. Their basic business model was successful, since this diverse collection of presses had a unique value proposition. 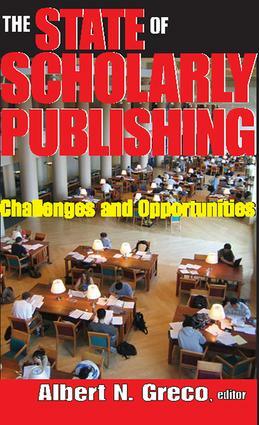 They dominated the scholarly publishing field with preeminent sales in three major markets or channels of distribution: libraries and institutions; college and graduate school adoptions; and general readers (i.e., sales to general retailers).Yet this insulated world changed abruptly in the late 1990s. What happened? This book contains a superb series of articles originally published in The Journal of Scholarly Publishing, by some of the best experts on scholarly communication in the western hemisphere, Europe, Asia, and Africa. These authors analyze in depth the diverse and exciting challenges and opportunities scholars, universities, and publishers face in what is a period of unusual turbulence in scholarly publishing.The topics given attention include: copyrights, the transformation of scholarly publishing from a print format to a digital one, open access, scholarly publishing in emerging nations, problems confronting journals, and information on how certain academic disciplines are coping with the transformation of scholarly publishing. This book is a must read for anyone interested in the scholarly publishing industry's past, its current focus, or future plans and developments.